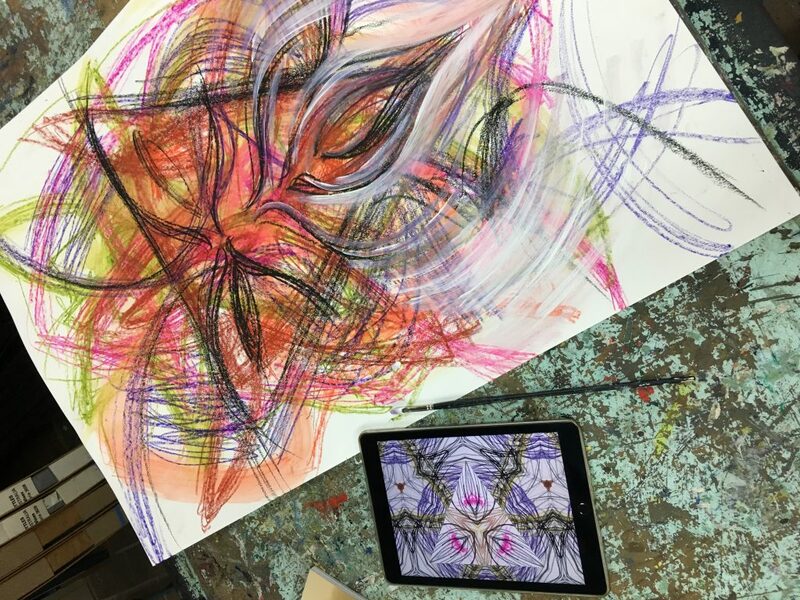 While the concept of mixing media is certainly not a new idea in Visual Art, working with a seamless combination of digital tools and traditional art-making processes is still a fairly recent proposition in many art education programs. 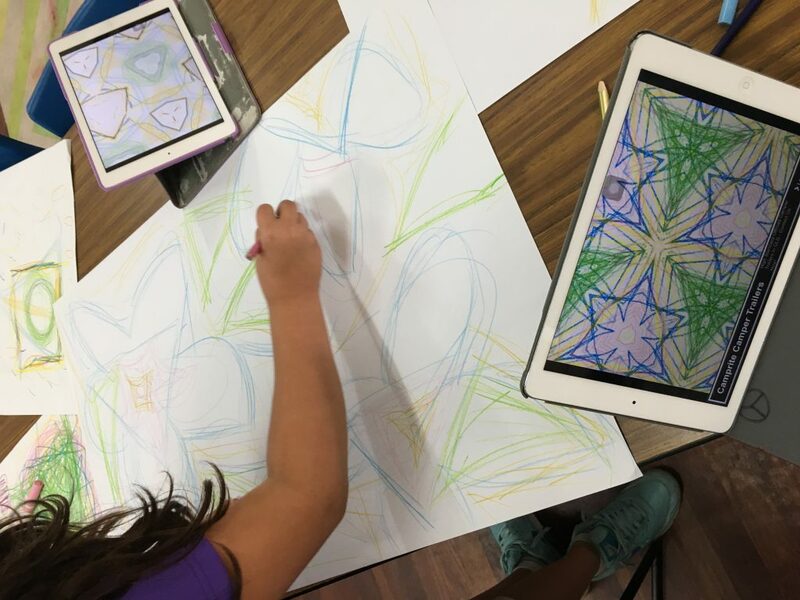 Considered instructional design can produce seamless movement between ‘apps and anything else’, and when technology permeates the art-making materials on offer, complex and organic workflows empower students to create. Using apps, charcoal, photography, anything and everything in combination, supports students to go beyond the screen, and to leverage the powerful tools they carry in their back pocket. 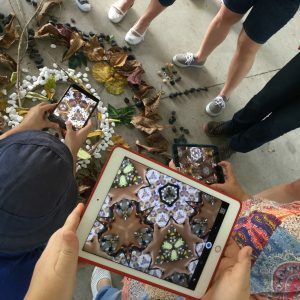 This post gives some examples of this idea in action using a variety of hands-on materials and just one app in pursuit of some diverse learning experiences through art-making. 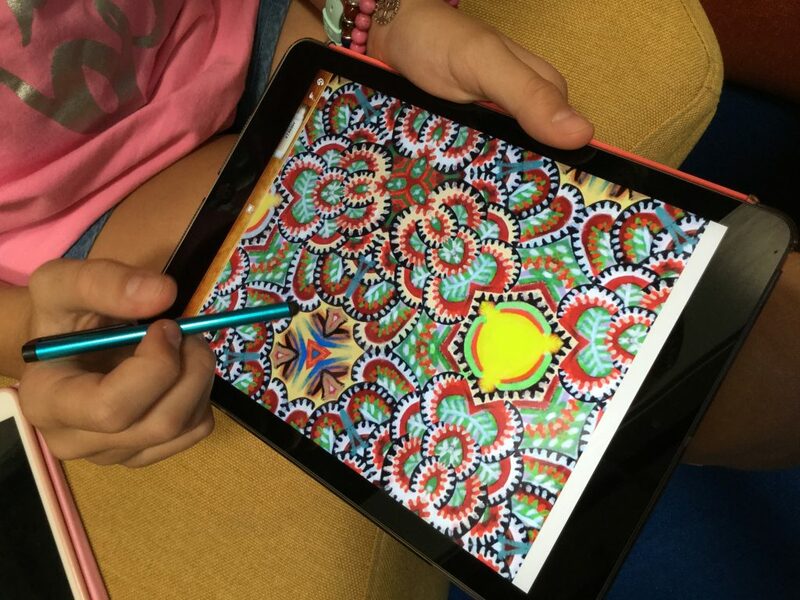 Using an app that produces kaleidoscopic effects by reflecting images through the live camera can provide students an opportunity to explore physical materials as exciting starting points for ‘tra-digital’ art-making. Supporting students as they ‘learn to look’ is often a challenge for arts educators. Using the live camera as a way to explore an art work is an exciting premise. 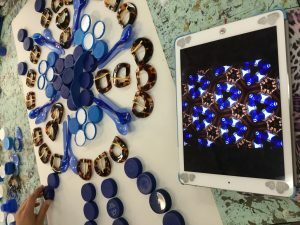 Holding up the kaleidoscopic lens to a work of art presents an opportunity for students to explore the elements of art in a new way. 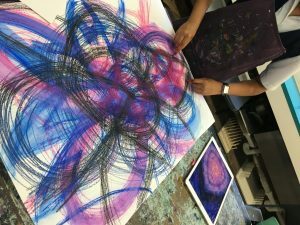 For many students, as the image is reflected and reconstructed they ‘see’ the colours for the first time, new lines are revealed, shapes dance and play. There are some really engaging entry points for appreciating art here. 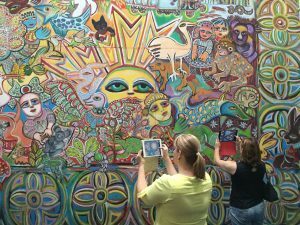 In the image below you’re seeing one student exploring a section of a Mirka Mora mural using the kaleidoscopic lens. 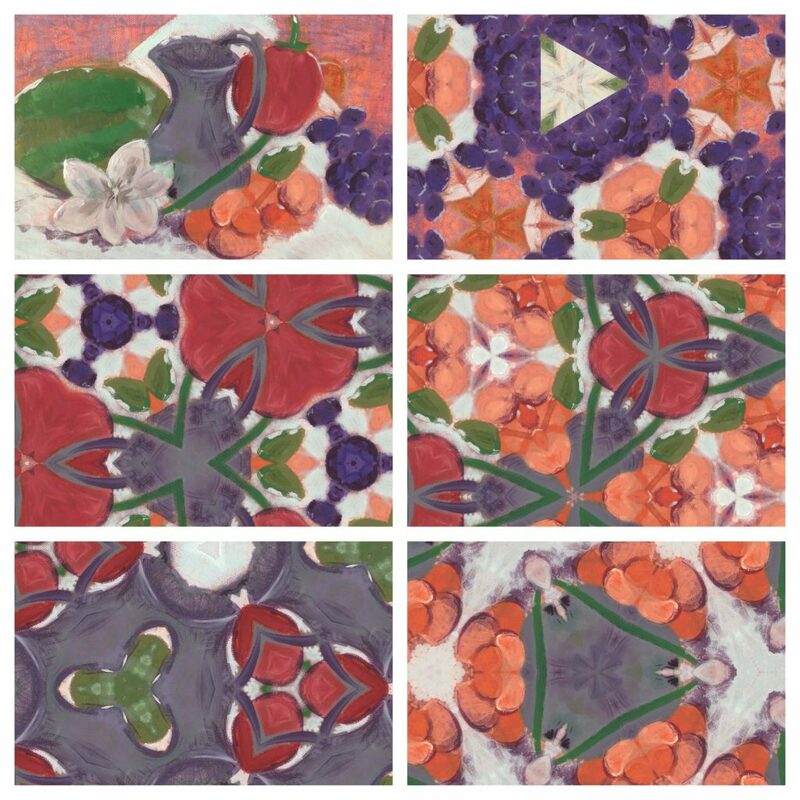 Students were encouraged to ‘steal like an artist’, using a section from the fresco on site to develop a digital image. Art Set app was used to draw over the top of existing colour, line and shape, and in doing so, starting points for new works were revealed. * Extend these ideas by building tasks that bring these starting points together as larger works. For example, print an draw over images, collaborate to produce a large scale work, and/or collage pieces together. * Younger students can ‘hunt’ for objects within a work and use the kaleidoscope camera to ‘document’ their discoveries. Teachers may choose a concept to drive these investigations, sending students on a ‘viewing mission’, looking for examples of line, creating imagery within a colour scheme, working to identify symbols and subject matter, etc. In this task, students working on paper using exploratory drawing techniques were asked to stop their sketching mid-way through an exercise. By hovering their ‘kaleido-camera’ over their work, the colour, lines and contours transformed and potential starting points for the next works were revealed. For many students this way of working represents and entirely new way to begin the creative process. Opportunities to explore alternatives to sketching during early production phases can boost the creative confidence of students who may believe that their ability to create is limited to their ability to sketch and render from life with accuracy. The students in the following images used their live cameras over preparatory drawings of geometric forms. The resulting digital images became the guiding works for large-scale layered paintings. 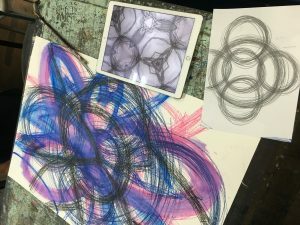 While many digital images begin as photographic works imported into devices, artwork created on the iPad can also be built OUT using physical materials. Here you are seeing a composition coming to life as students manipulate a variety of recycled plastics. 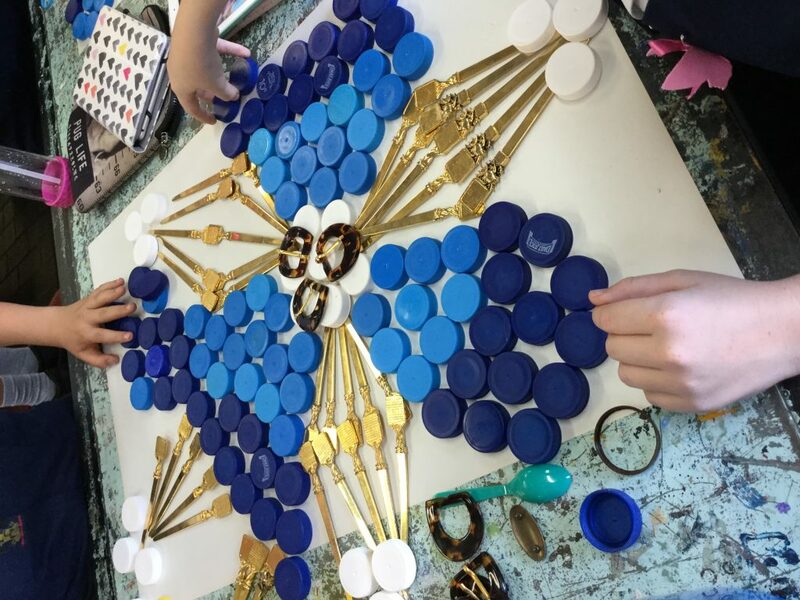 Students need to grapple with the concepts of layering, size, scale, space, etc they use physical materials to represent a digital composition in three-dimensions. 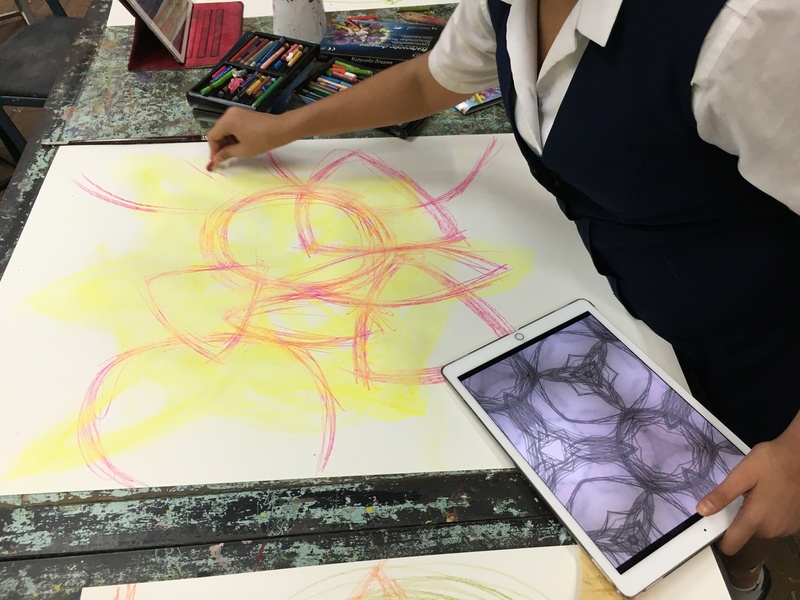 Using kaleidoscopic photographs created in app, students selected and printed a variety of images from their photos that contained interesting shapes and sections. 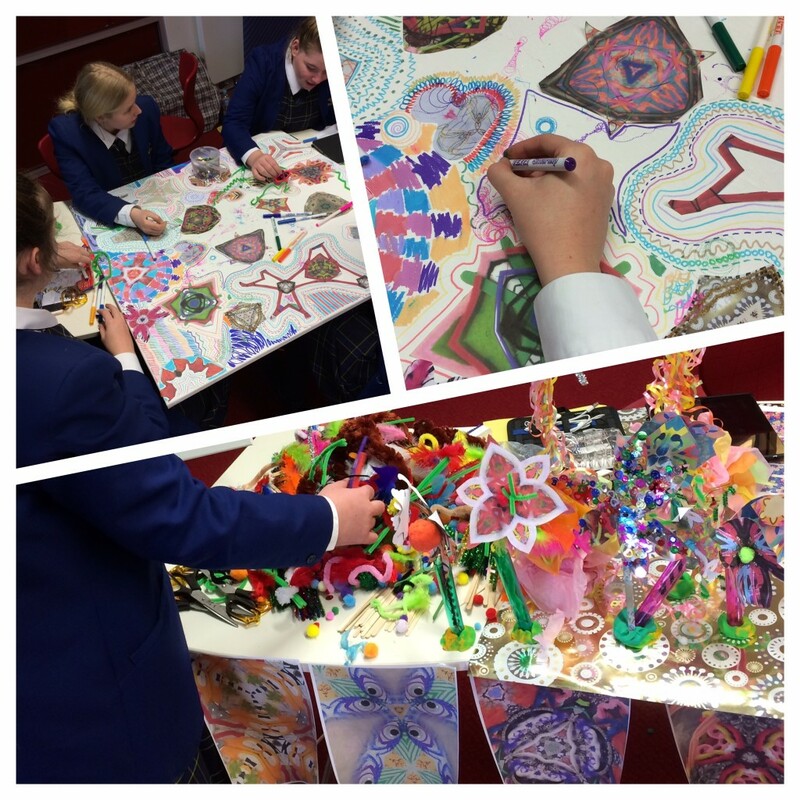 These diverse starting points were then grouped into shapes and colour schemes before being assembled as part a large collaborative work that involved folding fractals into fantastic relief paper sculptures. 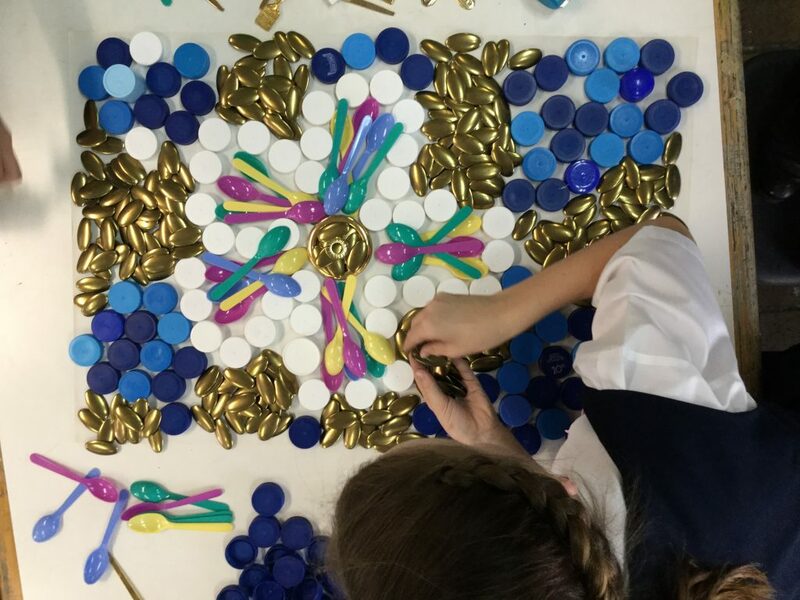 This lesson seed can be developed to connect mathematical concepts to art-making by exploring shapes, forms, nets, fractals and tessellations in depth. Produce patterns, using colour or shape, manipulate size and scale to produce nested constructions, or build sculptural works in three-dimensions. 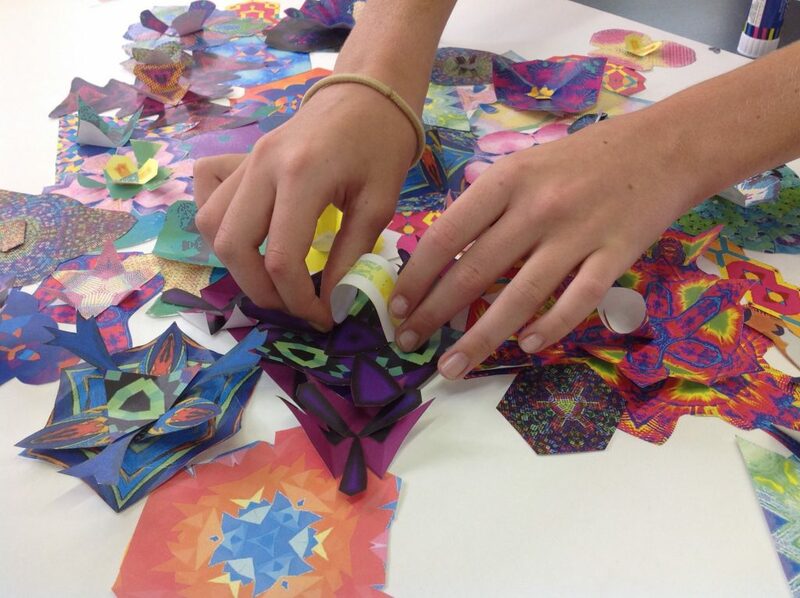 * Mix media and create cross-curricular learning experiences… We’ve used these ideas as a starting point and ended up creating fractal flower gardens, pin wheels that spin in the wind, etc. 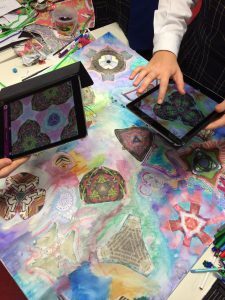 Using the kaleidoscopic live camera, students can engage with the concept of abstraction by hovering their iPad over representational imagery. In the example below, the still-life painting in the top left hand corner of these photographs was instantly reconstructed, giving this student an opportunity to see their work in a new way. Stripping away subject matter can reveal the potential of abstraction to transform line, shape, colour, etc. I do not have iPads for all the students in my art room. I’m going to try to do a similar activity in groups with just one iPad. Do you have any suggestions for this? Thanks! It’s going to be a case of sharing the iPad around, so knowing a structure that will suit your students throughout that process is important. The same sort of method you would share other tools or materials around the class is the place to start. I think it will be slow going, but this is such a rich task that I know it may be very worthwhile if you have the time to give it a go.